'Swords of Sorrow' #5 enters its penultimate issue with the gathering of the chosen women warriors standing together with the Traveller among them. The march to war against Prince Charming's gruesome forces is imminent. Gail Simone's epic crossover event nears to a close with more revelations setting the stage for the ultimate showdown between good and evil. 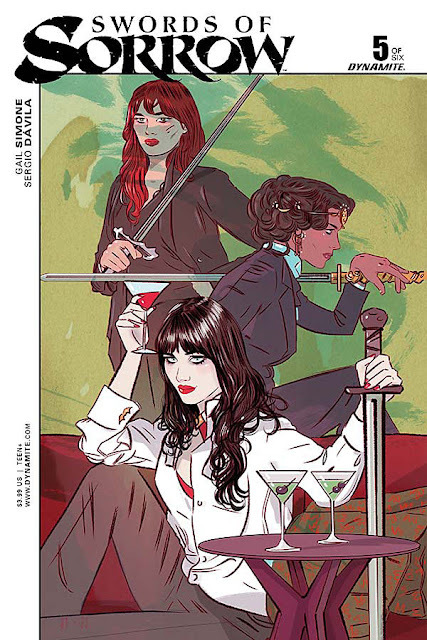 It's been a long, sometimes bumpy, road to this point in the Simone-orchestrated 'Swords of Sorrow' event that intertwined the strongest female characters in Dynamite Entertainment's catalog. It also involved some of the strongest female writers in comics as well. The result has been mixed with one-shots and miniseries providing some, often too little, character development before joining forces in the main book written by Simone and illustrated by Sergio Davila. Despite the hiccups the main story is still the most riveting. The Traveller reveals her identity and that of the person Prince Charming will risk everything to get back. She enlisted the help of many "valorous" women but her generals - Red Sonja, Dejah Thoris, Vampirella - hold the key to defeating the Prince and the biggest he-man woman-hating club the world has ever seen (not counting today's internet forums). Are there way too many characters? Yes. Are some severly underdeveloped? Yes. Are new characters abruptly introduced in issue five? Yes. Does it still bring a sense of tension and excitement? Yes! An undertaking like SoS is an ambitious endeavor and big crossover events in general are extremely hard to pull off and even harder to please everyone. Even with the occasional convoluted plotline, SoS has been a great win for raising the profile of female characters and writers. Simone's talented colleagues are well represented and those characters are the beneficiary of their hard work. Davila has taken the difficult task of illustrating the massive cast of characters with relative ease and precision. While he toils with filling the panels with so many heroines, Davila really takes off when concentrating on the women in the foreground. The Traveller, Red Sonja, Dejah Thoris, and Purgatori look so bold and fleshed out that they almost look three-dimensional. Jorge Sutil's colors bring the characters to life but really contributes to the dark atmosphere of impending danger with his gloomy landscapes. 'Swords of Sorrow' continues to shine amid a deluge of converging characters and storylines with Gail Simone keeping it all together with the strength of a thousand amazons. She lays it all out on a map quite literally and that helps to navigate the final march between the tens of valorous women in a collision course with the Prince's minions. No matter what issue six should be a barn burner.